Marmande (in Occitan, Marmanda) is a commune in the Lot-et-Garonne department in south-western France. In June 1219, the town had already been besieged for weeks by Amaury de Montfort when Louis, the king's son, Louis, arrived. Louis had been in England - and well on the way to winning the throne of England - largely at the invitation of the barons who had had enough of King John. But when John died suddenly in October 1216, the incomparable William Marshal stepped in as Regent for the infant King of England, Henry III. Not even kings relished the prospect of facing William Marshal and the whole purpose of Louis' presence in England was now gone. The young Louis was wise enough to make peace with and withdraw after a couple of quick but severe thumpings at the hands of Marshal. Now Louis was in the Languedoc, a much better prospect for plunder having been exhausted by years of war waged by the French Catholic armies. He arrived with 20 bishops, 30 counts, 600 knights and 10,000 foot soldiers. No i remas hom ni femna ni joves ni canutz. Ni nulha creatura, si no s'es rescondutz. La vila es destruita e lo focs escendutz. All were slashed and cut to shreds by keen edged swords. As if they had rained down from the heavens. Marshland and firm ground, all was red with blood. No living creature, except perhaps some well-hidden infant. End of the IX th Century — a castrum is built on the site of the present jardin du château. 1050 — a new château is built in stone « la mirmande ». 1219 — During the Albigensian Crusade the town is burned and partly raised by Catholic Crusader troops led by de Montfort. 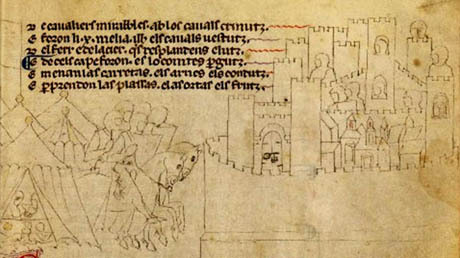 1324 — 1386: Construction of the second enceinte at Marmande. 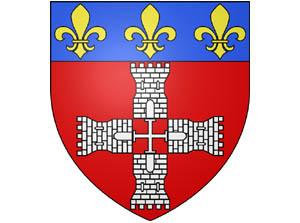 1414 — Le King of France Charles VI, accords to Marmande the three fleurs de lys borne in chief on the arms of the town of Marmande for its fidelity to the French Crown during the Hundred Years’ War. 1548 — The inhabitants rebel (regretting their earlier decision) resenting oppressive salt taxes. ( la Gabelle). 1561 and 1569 During the Wars of Religion the Huguenots, burn down the Fransiscan Friary and kill some of the Friars. 1576 and 1577 : the future Henri IV besieges Marmande. 1777 — the city walls are demolished.